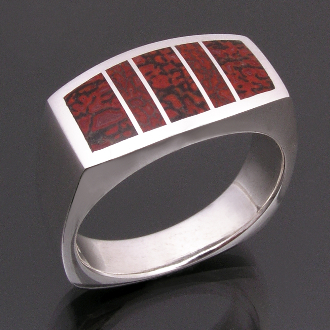 Man's sterling silver ring inlaid with dinosaur bone by Hileman Silver Jewelry. This handmade ring is inlaid with 2 different kinds of gem dinosaur bone- red orange with black matrix and reddish brown with grey matrix. The width of the ring is 11mm and the length across the top is 20mm. The ring is square shanked for a more contemporary design and to resist turning on the finger. The dinosaur bone ring in the photo is shown in a size 10 1/2 for scale and may be special ordered in other ring sizes or other inlay materials. Most special orders can be completed in 4 to 6 weeks. The dinosaur bone used in this ring is usually referred to as “gem bone”. This Utah dinosaur gem bone came from the Colorado Plateau and was a living animal during the Jurassic Period around 144 to 208 million years ago. It is actually not bone but is a combination of minerals that replaced the bone over time. Dinosaur bone is found in a rainbow of colors with the webbing color and cell size varying greatly from piece to piece. The varying cell size and colors create some truly unique patterns and virtually one of a kind pieces of jewelry. The fossilized dinosaur bone can be composed of many different minerals including agate, jasper and calcite. The dinosaur bone color is determined by the combination of minerals present when the fossilized bone formed. Read more about dinosaur bone on our blog or see dinosaur bone jewelry photos on our Flickr page.